It has been my experience that a good hair straightener is hard to come by. You see, my thick, coarse hair can be problematic. Most days, I just want to get it straight without putting in a lot of effort. I don’t think that’s asking too much. There are several attributes I look for in a good straightener. Ideally, I want one that gets to just the right temperature and just kind of glides through my hair smoothly, without tugging or breaking my hair. With my hair being so thick, I need the plates to retain heat so that I can keep using it, without waiting for it to get hot again. When I get silky straight hair, in 20 minutes or less, I know I’ve found a winner. The NuMe Silhouette gets the job done as I have just described. I was recently sent one to try out for this review. I chose the turquoise one, but they also have pink and black. I just love it, I think it’s so pretty! Not only is it nice to look at, but it’s also a powerful styling tool. With rounded plates of pure ceramic, you can either create soft curls or pin straight tresses. With temperature controls ranging from 140ºF to 450ºF, you will be able to fine tune the heat to the unique needs of your hair. Other great features include negative ion technology, which conditions hair, keeping it lustrous and healthy and an ergonomic design which features a soft touch finish, and a salon-style swivel power cord. I have found that I have been really impressed with this straightener. It would be really easy for me to tell you to believe me when I tell you that this straightener is great, but it’s one of those things that you really need to experience for yourself. How would you like a discount? The Silhouette normally retails for $139, but NuMe is offering a special discount for Sweet Deals 4 Moms readers. 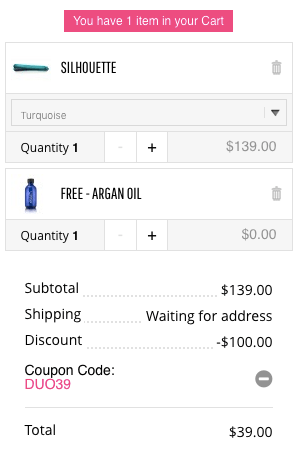 You can get the Silhouette, Free Argan Oil (includes free shipping) for just $39 with code DUO39. You won’t be sorry. Go here for yours. Win it: One of you will win the Silhouette in your choice of colors. Please enter through the Rafflecopter below. It may take 30 seconds or more to load. Giveaway is open to US and CA. I like the Classic Wand. I like the NUME travel kit! I also like the Megastar straightener. All the straighteners look so nice. The NuMe TRAVEL KIT would be great to own—would make an awesome gift! I looooove that megastar straightener!! looks Amazing!! I like the Bold Dryer. I need a new hair dryer. I’d like to try the Octowand. I would like the nume SILHOUETTE in turqouise. Thank You! I think I would really like the megastar straightener. I would love to have the pearl curling wand! I like their NuMe TRAVEL KIT ! The travel kit looks incredibly useful! I like the MAGIC WAND 32MM. I like the Signature Dryer in turquoise. I would also like the classic wand 25mm. I’d choose the Titan 3! I also like the Boutique Collection from NuMe. I would really to have the megastar straightener. The ionic round brush looks very nice! I like the Signature Dryer.